Whistler is known around the world for beautiful scenery and forests. Throughout the winter the streets are buzzing with tourists and local sports enthusiasts. Come spring, it is time to call Whistler Gutter Cleaning. Whistler Gutter Cleaning is recommended as a bi-annual property maintenance routine, once in the spring to dislodge any debris that may have accumulated over the winter months as well as once in the fall. The changing temperatures in Whistler make it extremely important to maintain proper Gutter Cleaning. If gutters are not cleaned properly the debris within will stay put throughout the Winter months. If unable to properly drain, thawing creates a breeding ground for insects and a cozy home for rodents. Although the wildlife in Whistler is nice to see, squirrels and mice make poor houseguests! 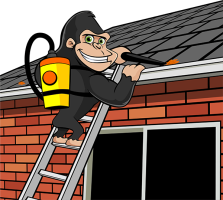 Bringing in the Gorillas ensures not only a thorough Gutter Cleaning, but a job done with safety and care for your property. Misplaced ladders and inexperience can lead to gutters collapsing under the threat of too much weight. Our Gutter Cleaning services come with experienced and reliable employees who will not only clean the gutters, using vacuums, as well as other tools to ensure complete removal of debris along with testing the gutters and drains to ensure flowing water. To keep with the historical nature of Whistler, there are many wooden structures and lodges present throughout the town. Sitting debris and clogs within the gutters causes damage to the gutters as well as the interior of the structure. With average rainfall in Whistler being 48.3 inches per year, that is a lot of water unable to flow that also has the potential to run into a property with the potential to cause mould or structural damage. Call today to book an appointment for your Whistler gutter cleaning. Our technicians are happy to answer any questions you might have regarding the maintenance and care of your gutters.